Figured I should start a build thread for this. My wheels and tires came in last week and I just had two days off of work so I spent both days working on the bike. I got the wheels mounted and center. The front pretty much went right on, the back was a whole other story. 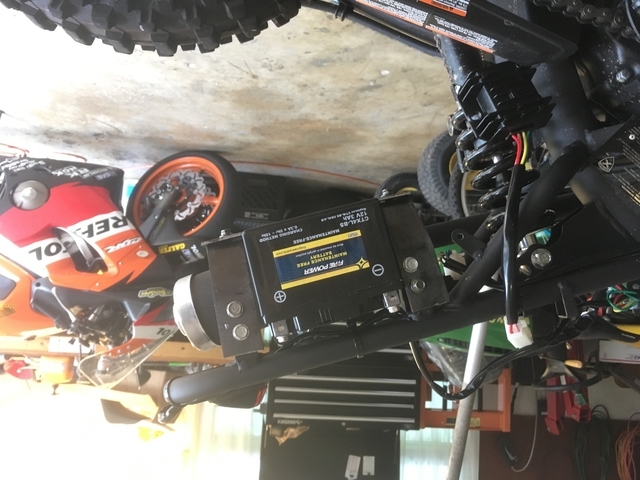 I also got my battery wired up and mounted. I had the lights working before off just the stator, but the bike would die after a few blocks. I'm guessing the lights were drawing too much power at higher rpms. Now with the battery the bike runs great and the lights stay on the whole time. All I need now is a horn, and a mirror and I can try to get it registered. 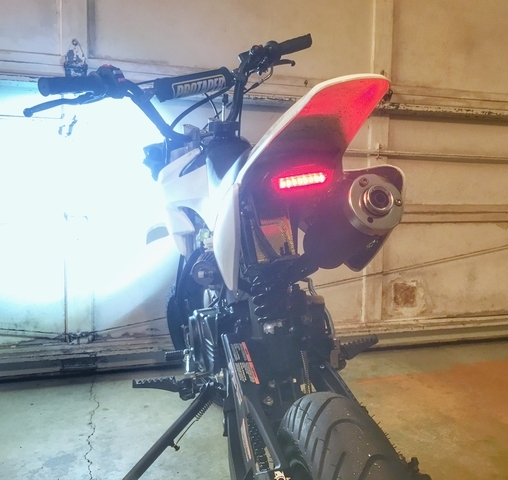 Clamped the tail light to the back of the frame. Works great, lost my ability to pickup the bike from there though, not too happy about that. 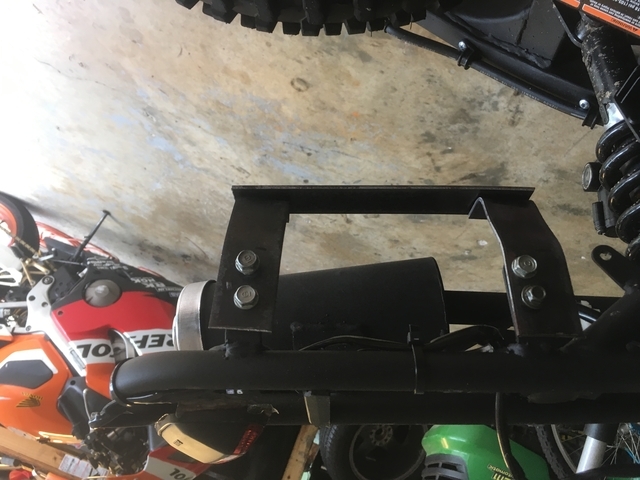 I also don't know if this is going to fly on an inspection, it's mounted a little far forward. This is more awesome than I can even believe. Did any of these come with batteries? 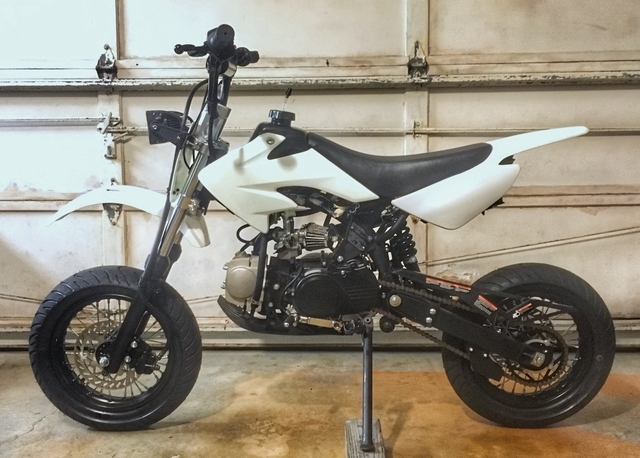 This is going from a pit bike to a supermoto!! There is electric start versions that come with batteries already on them, but I believe they're 6 volt. The Honda is going to get jealous of this thing, haha. 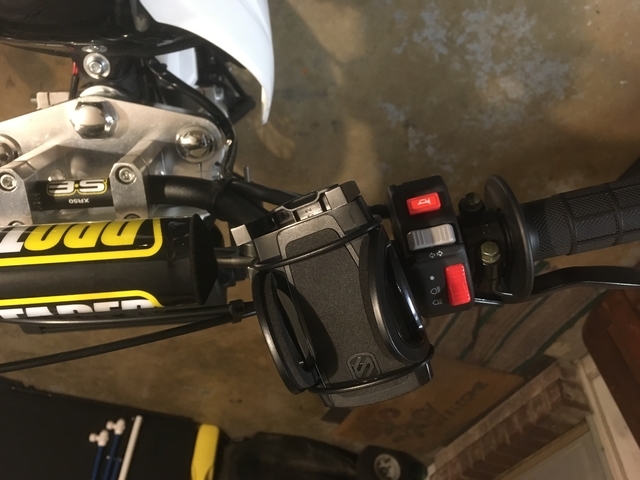 Got a new throttle in the mail a couple days ago. 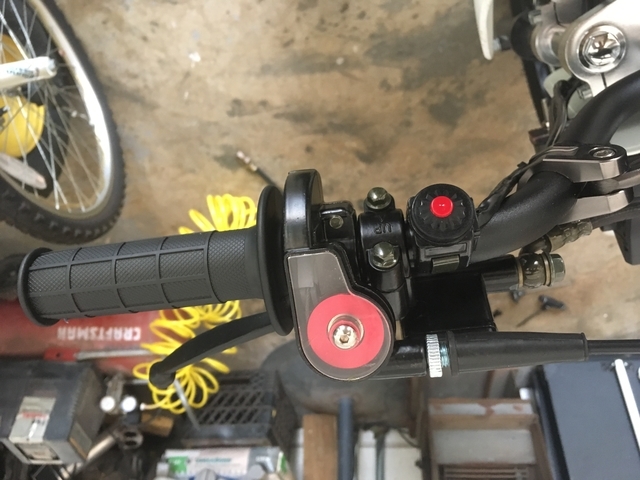 The length of pull on the stock throttle was so long, to go full throttle from a normal riding position I'd have to either adjust my hand on the grip half way through, or hang off the right side of the bike with my elbow pointed straight down hahaha. The crazy length made the bars shake when shifting at higher speeds. 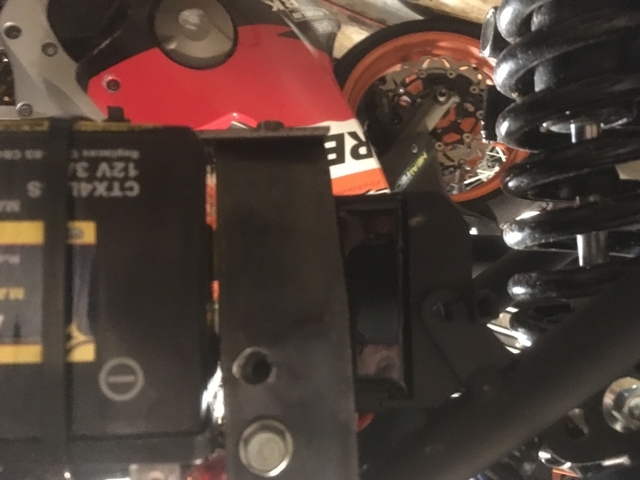 The new throttle is 1/4 turn and almost as short as the cbr throttle. I went to Walmart to look for a clamp on bicycle mirror but the only thing they had straped onto the left grip. I did find a handlebar clamp phone mount though. Works better than zip ties when I use my phone as a speedo. I can't believe how much I want one of these now. You are gonna make me spend money. Do it Jeremy! It's hard to believe how much fun it is even though it'll only do 50mph. I will say though, the factory suspension is not made for a full grown person. I weigh 150lbs right now and to really make this thing handle well, it needs suspension upgrades. Luckily though, pretty much everything aftermarket parts wise is very cheap compared to a full size bike. Just a little update on this. I had a motor mount bolt snap a few weeks ago, and just a few days ago the swingarm pivot bolt snapped, and the rear shock came apart. So what I'm going to do now is go crazy on it. I've already ordered a new rear shock (fully adjustable and suitable for adult weight) and chain. Plastics and a front fork upgrade will come soon, also fully adjustable and inverted. Then new tires and a couple engine performance mods plus some dress up crap. The bike will be black and orange for the most part. Not sure if I'll build it piece by piece or wait until I have everything and then put it together, we'll see how it works out. The Honda is also down at the moment and needs about $400 worth of parts thrown at it. Whoa. Total bummer! At least the parts for these things are cheap... right? For the most part. The range goes from dirt cheap China stuff, to high end parts. I'm gonna try to stay about the mid range on stuff. Even the more expensive suspension parts are still about half the price of a good set of ohlins for the cbr so it's not too bad. 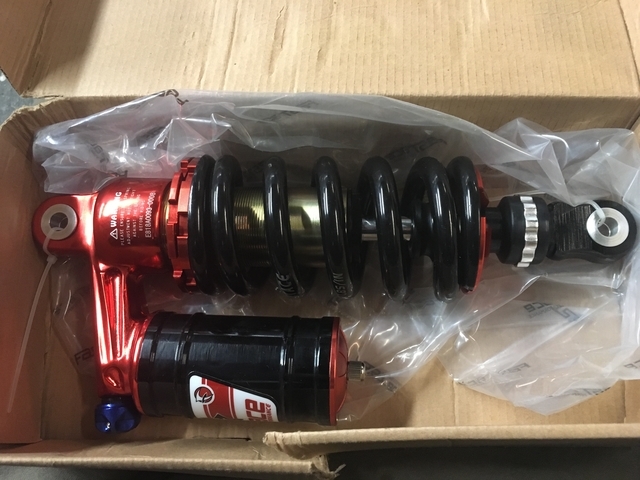 I paid $150 for the rear shock that I bought. It has an external reservoir, adjustable compression, damping, and pre-load. I'm probably gonna buy a new top end for my dune buggy. How do I tell the crappy stuff from the good other than price? Any idea? Honestly I couldn't tell you. It seems that even the higher end stuff (price wise) for the pit bike is still made in China. 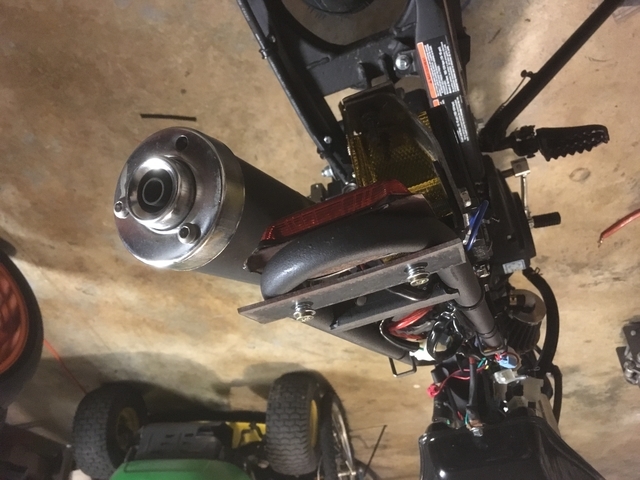 What engine is it in your dune buggy? Almost all the pit bikes have engines based off the horizontal Honda 50cc. 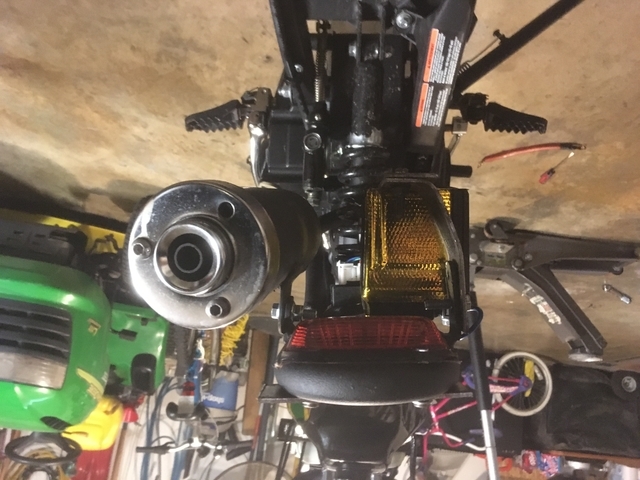 T-boltusa.com is a good place to start looking for engine parts if it's the same as my pit bike. Some of their parts look really nice, but it also gets expensive fast! You can buy a Honda 50 based 190cc. 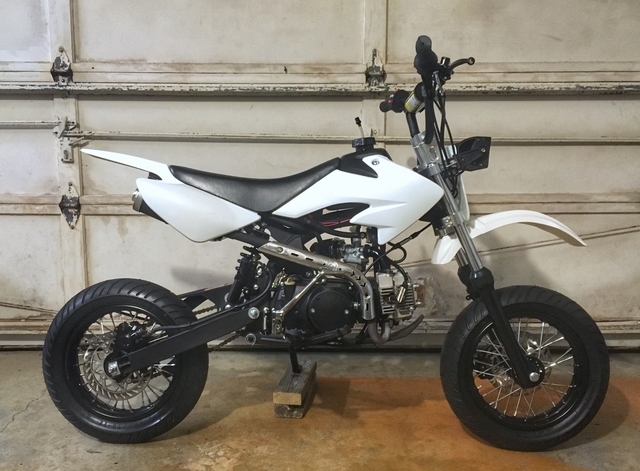 I couldn't imagine how fast my pit bike would be with that in it, but not fast enough to make the $1200 price tag worth it. My shock came today. It looks to be good quality. We will see. The reviews on the brand are mixed with lots of people reporting blown seals within a year. I am like 90% sure my engine is known as a Gy6 150cc. I can buy complete top end rebuilds with the cylinder, the head, piston and gaskets for like $75. It sounds too good to be true, but if it stops my engine from burning so much oil, it's totally worth it. Also - 190cc in that bike is damn near irresponsible! lol I once crashed a 50cc honda and I swear I broke every rib in my body even though I didn't go to the doctor. I hurt for like 6+ months, and sneezing nearly caused me to cry. I can't even begin to imagine how hard I would crash with 190cc's! (I also crashed in front of a bunch of good looking ladies, which hurt my ego as much as my ribs).